Be the first to share your favorite memory, photo or story of Mrs. Christine Bone. This memorial page is dedicated for family, friends and future generations to celebrate the life of their loved one. 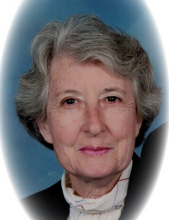 Mrs. Christine Bone Swafford, age 88, of Dallas, Georgia, passed away at her residence on Saturday, March 23, 2019. Mrs. Swafford was born on December 23, 1930 in Dallas, Georgia to Ms. Josephine Bone. She has been married to Mr. Roy Gene Swafford for 52 years. Mrs. Swafford worked for many years as a payroll accountant for Lockheed. Mrs. Swafford was a member of Dallas First Baptist Church. Mrs. Swafford is survived by her husband, Mr. Gene Swafford and her cousins, Jean Bone Lewis, Jane Bone Moody, Carol Clark Vann, Johnnie Bone Escalera, Mike Clark, Larry Bone and Gayle Bone Cox. Mrs. Swafford was preceded in death by her mother, Ms. Josephine Bone; her grandparents, Mr. and Mrs. Raymond (Maudie J.) Bone and her cousin, Jimmy Clark. Funeral Services for Mrs. Swafford will be held on Tuesday, March 26, 2019, 1:00 PM at Benson Funeral Home Chapel. Rev. Don Rackley will officiate. Interment will follow at New Hope Cemetery. Pallbearers will be Max Williams, David Wigley, Andy Wigley, Jerry Thomas, John Arnold and Ray Cole. Visitation for Mrs. Swafford will be held on Monday, March 25, 2019 from 5:00PM - 8:00PM and Tuesday, March 26, 2019 from 11:00AM – 1:00PM. All visitations will be held at Benson Funeral Home. To send flowers or a remembrance gift to the family of Mrs. Christine Bone Swafford, please visit our Tribute Store. "Email Address" would like to share the life celebration of Mrs. Christine Bone Swafford. Click on the "link" to go to share a favorite memory or leave a condolence message for the family.